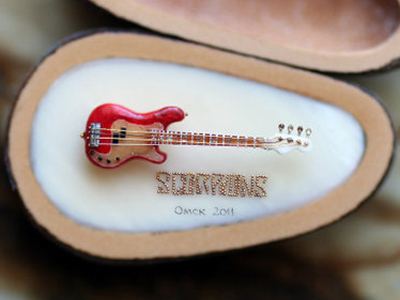 In advance of the Scorpions concert in the Siberian city of Omsk as part of the group’s farewell tour, a Russian micro-miniature artist and his son have made a unique copy of a Scorpions bass guitar. ­The mini guitar is an exact replica of the real instrument used by the rock musicians. Its size is only 9.9 mm. Its body is made of a mammoth’s tusk, the neck of a cactus thorn and the strings of gold. All the guitar’s metal parts are made of gold and silver and the group’s logo is made of golden balls. The whole piece is set on a mini-plate also made of a mammoth’s tusk and is put inside half-a-pignolia. The makers Anatoly Konenko and his son Stanislav hadn’t ruled out giving it as a present to the Scorpions, but after numerous requests the miniature will become an exhibit in the Omsk miniature museum. “It’s an exceptionally good one, and we would be really sorry to give it away. We won’t be able to do it again,” they say. Anatoly Konenko began his career in 1981, becoming the first micro-miniature artist in Russia’s Siberia. He invented and mastered the techniques of painting on rice and poppy seeds and on a human hair. The artist has published more than 200 miniature books. His edition of Chekhov's "Chameleon", published in 1996 in Omsk, includes 29 pages, 3 color illustrations, and a portrait of Chekhov, and measures 0.9 x 0.9 mm. Anatoly Konenko has been listed in the Guinness Book of Records for this manuscript. Konenko’s most famous creations include "A shoed flea", “Grasshopper playing the violin”, "A Caravan of Camels in the Eye of the Needle" and “the Eiffel Tower on a mosquito proboscis”. And 50 years after man’s first flight into space, the artist and his son have made a miniature photo album with the photos of cosmonauts 48 by 32 millimeters in size. Have a merry micro Christmas!